Putting up a united face after reports of differences, Advani, who was accompanied by Modi when he filed his nomination, expressed confidence about the party's success and said he was sure BJP would form the next government. About the controversy that surrounded his candidature from Gandhinagar after reports that he wanted to contest from Bhopal, Advani said his relation with Gujarat was more than just fighting elections. 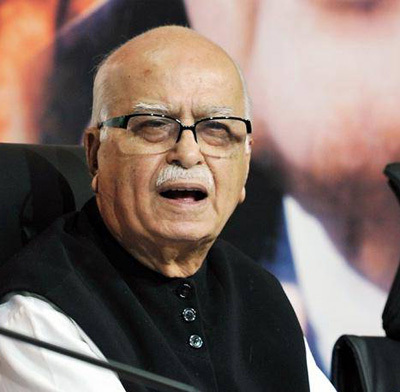 Asserting that he never intended not to contest from Gujarat, Advani said adding the state has given him shelter after the country's partition in 1947. "Our friends from Madhya Pradesh wanted me to contest from Bhopal also. But I have never intended not contesting from Gandhinagar." Advani, who has been representing the Gandhinagar Lok Sabha constituency since 1998, wanted to fight from Bhopal this time as per party sources and was miffed when he was given Gandhinagar seat. He could be convince only after visits from several party leaders, including Modi, as well as intervention from the Rashtriya Swayamsevak Sangh, say party insiders. "... my relations with Gandhinagar and Gujarat did not start when I started contesting from here. They started with the unfortunate incident that accompanied India's Independence," Advani said, referring to Partition, after which he and his family moved to India from Pakistan. "My father stepped in Adipur (a Kutch township) for a brief while. He then moved to Kashi (Varanasi), where my grandmother wanted to spend her last days. "He was there for three-four four years and then shifted to Adipur. This is the background of my family's association with Gujarat," he said. Addressing a public meeting before filing the nomination, Modi urged BJP workers to ensure Advani wins. Advani was also all praise for Modi.